Jim Bates, Jr. joins his father in being inducted into the Bristol Sports Hall of Fame. A standout in both baseball and basketball, the younger Bates started his athletic career at Mary A. Callen and Memorial Boulevard Schools and in the Forestville Little League under coach Bob Watson before entering Bristol Eastern High in the mid-1970s. He was a four-year letter-winner in both basketball and baseball at Eastern while being a team captain in each sport his senior year. A three-year per­former for the Bristol American Legion baseball team with MVP awards his final two seasons, he was captain in 1979. He set numerous offensive records in basketball at Eastern, including the school and city season scoring mark in 1980. The New Haven Register selected him to their 1980 All-State Basketball and Baseball teams. Following this, he played both sports at Trinity College, and was an All-New England selection at the college level in both sports. He set the school scoring mark at Trinity in basketball his senior year and was honored with the Sheldon McCook Award as the school’s top athlete. 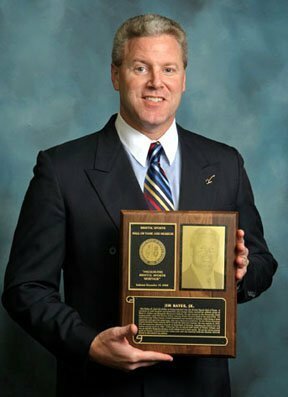 Jim was inducted into the New England Basketball Hall of Fame in 2009.